Instead of bolting to eyelets on the frame or fork, Thule's Pack 'n Pedal Tour rack mounts on your bike with ratchet straps. That makes it one of very few options if you want to carry bags on a frame with no rack mounts, and while it works well, it's a bit heavy and expensive. The Thule Pack 'n Pedal Tour rack will fit pretty much any bike - racer, 26er, 29er, whateverer - and is fairly easy to swap between them whenever the fancy takes you. Thule are better known for roof racks, and in the bike world for their roof-, towball- and hatch-mounted bike carriers. They bought the design for the Pack 'n Pedal rack from New Zealand product design company Freeload and have developed a range of panniers around it, some of which we'll be reviewing over the next few weeks. The rack is made from aluminium and glass-fiber reinforced polypropylene, assembled with stainless steel bolts. It comes with a selection of struts that should allow it to attach to virtually any bike. We used the shorter struts for a fairly standard road bike, and the medium-length ones to get the rack level on a smaller hybrid. The very longest struts will likely work for the very low stays on some suspension mountain bikes, but we didn't try that. We'd be surprised if you can find a standard double diamond frame the Tour rack won't fit, though you might run into trouble if you're running tyres fatter than 2.5 inches wide. As this is a website mostly about road bikes, that shouldn't be a problem for most of you. The ratchet strap attachment system works well - much better than you'd expect from looking at it. It really does provide a platform stable enough to hang up to 18kg of luggage off (25kg if you strap it on top). To fit the rack, you thread each of the four straps through the mechanism and then tighten it up with the supplied 5mm ball-end Allen key. Thule also supplies a security release key to loosen the rack, so a passing low-life can't steal the rack. The key has an offset pin to release the ratchet mechanism, and as far as we can tell it's unique to the Pack 'n Pedal rack, so keep in somewhere safe. The main selling point of this rack is its versatility and the only situation we found where it ran into trouble was fitting bikes with cables down the seat-stays like some cyclo-cross bikes. If that's your bike, try before you buy to make sure the cables and straps don't do battle. The rack works best with Thule's own range of panniers. It is possible to use other panniers, but you might run into problems with the fatness of the tubes (Ortlieb), or the solid plastic platform that gets in the way of the hook release (Carradice). Thule sells a pair of side frames that allow you to use 'virtually any type of pannier' and that also have a second rail so you can mount the panniers nearer the ground for a lower center of gravity. These will cost you another £25 on top of the £85 you've paid for the rack (£22.49 and £76.95 if you shop around). That's the same retail price as the stainless steel Tubus Cosmo. The Cosmo weighs 730g, against the 1420g of the Tour rack with side frames, and will carry twice as much. Tubus offer adapters to coax a rack on to a frame without eyelets too, though Thule's way of doing things is undeniably more elegant. If you haven't got braze-ons, or your bike has some other awkwardness that makes fitting a regular rear rack difficult or impossible, the Thule Pack 'n Pedal Tour rack is a great way to carry luggage. It's well-made, the design is clever and it's surprisingly solid on the bike. Having said that, it might be worth thinking about why your frame doesn't have braze-ons: it might not be designed to carry loads, and you might run into issues around stability under load and heel clearance. If you do have braze-ons, the Thule rack is still a viable option, but most regular four-bolt racks will be cheaper, weigh less and will be more stable. Our racks can be fitted on virtually any kind of bike. And our bags to any kind of rack. But needless to say, using our racks with our own bags is the best solution. With their combined number of smart solutions, you will get the best, safest and most comfortable ride - no matter what you're bringing. o Includes rails for mounting panniers. o Patented attachment system secures easily. o Works on the rear seat stays and front fork. o Works with any type of frame material. o Tough construction allows for variety of rugged riding uses. o Silent and vibration free performance. The aluminium and polypropylene components look well made and are assembled using stainless steel bolts. Does the rack provide a sturdy platform that stays put and allows you to hang panniers off of it? Yes. Much better than you'd think from looking at it. I have not had this rack for nearly long enough to comment on long-term durability through experience. Having said that, it's certainly well made and I would expect it to last you a long time, provided you keep all the bolts tightened. There are lots of comments on the internet from people who question the durability of a 'plastic' the rack on longer tours. Mostly from people who haven't actually seen or used the rack. One review I read was from a lady who had used a Sport on the front and a Tour on the back for 5 months through the Andes and had no problems. You don't get much change from a kilo, more than 150 grams heavier than the standard Blackburn EX2 (and twice as expensive). If you want to use non-Thule panniers, you'll need the sideframes which add another 430 grams. Nothing particularly comfortable or uncomfortable about it. At £85 RRP (£10 discounts can be found online), twice as expensive as the Blackburn EX2. About a tenner cheaper than the Tubus Logo rack. Significantly heavier than both, but more versatile. Bear in mind you'll more than likely need the optional sideframes (another £25) if you want to use non Thule Pack 'n Pedal panniers. It's a luggage rack and it does the things a luggage rack does. However, it's a shame there isn't a mounting point for a rear light and the full plastic platform construction on the top can make it difficult to release certain panniers. The Carradice C-hook system proved troublesome for me. The struts have a large diameter which rules out certain panniers, like the Ortlieb classic front pannier for example. The optional side frame (£25 RRP) may well sort some of these problems out - we're testing a set at the moment. I was pleasantly surprised how well it works. Although it's billed to work with any pannier, that's not really the case without the sideframes. Did you enjoy using the product? It worked well enough, but I didn't enjoy using it more or less than any other rack I've used. Would you consider buying the product? No. Having used it, I'll go back to using a traditional rack. If I wanted to fit a rack to my mountain bike (which doesn't have braze-ons) though, I would definitely consider it. Would you recommend the product to a friend? If they need to put a rack on a bike without the necessary braze-ons, then yes. The rack works better than you'd expect from looking at it, but works best with the Pack 'n Pedal panniers. Try before you buy if you plan to use your own. oh dear, I have a few Thule products which, although not cheap, have proved their worth. But honestly, in excess of £100 for a rack setup on a bike not designed to carry those loads? Sounds like a failed entry from The Apprentice. - What I mainly use them for is bikepacking, ie light mtb touring offroad; I wasn't using panniers, but had strapped drybags on these front and rear. Rock solid, plenty of places to attach straps to. Weight not really an issue, my bags are much heavier than the racks. Currently I use it on a steel frame but still use the textile tape as anti-slip. The problem with the Ortliebs I tried was that, without the side panels, the aluminium tube is too fat for the Ortlieb lower hook to go around it. With the side panels (which I didn't have to test) I expect it's no problem at all. I have tested myself this bike rack and I think that this 85 pounds is too much for what it offers. It looks good, the brand is there but lacks in enginering quality, bike racks priced so high shouldnt slip on the frame. I experienced slippage also until I realised I wasn't mounting it properly. The oval rubbers are placed between the seat stays and the rack. The straps are fitted as follows. The instructions are not clear so it takes some working out. 2. Prepare oval ring and short end of strap to fit between the frame and the rachet system. 3. Once the ratchet system is resting on the oval rubber wrap the strap around the frame and then under the ratchet mechanism. 4. Take the rest of the strap and feed it through the ratchet system. 5. Use the hex key provided to tighten it. As you tighten it the long strap finds around the fitting and becomes shorter. I struggled initially and took me hours to figure it out. If you need help don't ring Thule write to me and I offer you assistance. 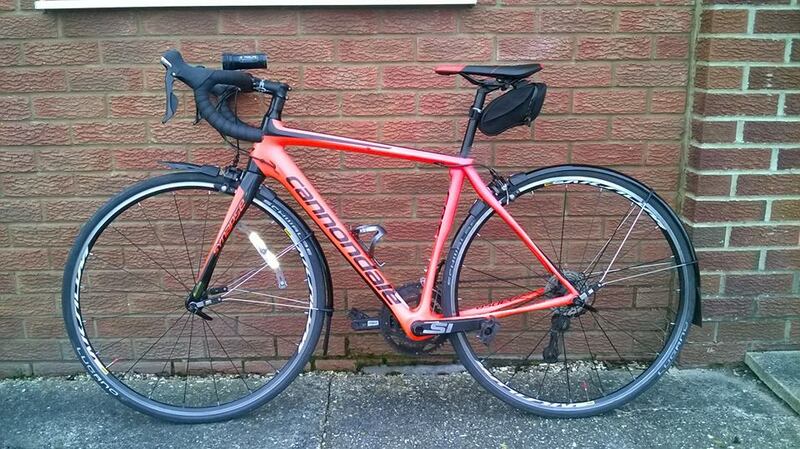 Here is the Thule pack and pedal pannier/rack system on a Cannondale 2014 CAAD8 105. I am very surprised at the result. It took me hours of figuring out the ratchet system. But I sorted out the ratchet system it is and proves to be a very strong rack. The rubber oval cleat cushions the rack against your seat stays and this also prevents slippage. It is a good product and very clever.